The chart above shows the number of times each possible number combination has appeared. 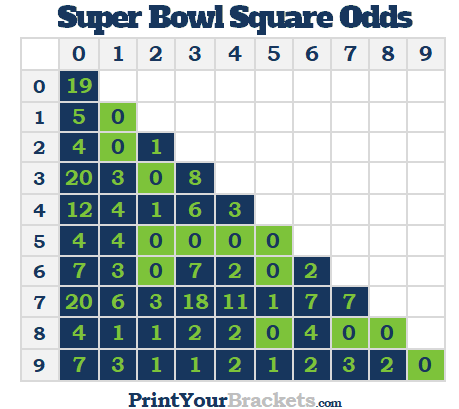 There have been a total of 212 quarters played in the 53 Super Bowls. Please note: We used the final overtime score in place of the 4th quarter score in the New England/Atlanta game in the 2017 Super Bowl. As you can see there are 13 different combinations that have never appeared in a Super Bowl and the number combination of 0 and 7 is the most popular, appearing 20 times. To use this chart, simply find the largest of your 2 numbers in the left column, then the smallest of your 2 numbers in the top row. Where these numbers intersect will show the number of times this combination has happened at the end of any quarter of every Super Bowl. At the bottom of this page we have links to pages that list the score by quarter for all of the past Super Bowls, from Super Bowl 1 to Super Bowl 53. We have also listed the last digit of the scores at the end of each quarter, which is typically used to decide the winning squares. 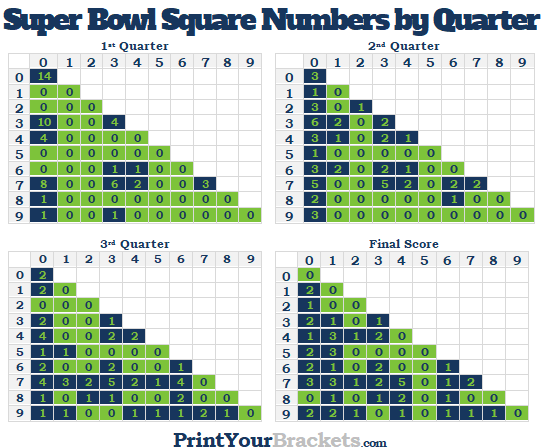 The image below shows the number of times each combination has appeared in each quarter of all Super Bowls. View the Past Super Bowl Winners and Scores.